Welcome to "The Reasons We Homeschool" and the first week of the 2018 Virtual Homeschool Fair, hosted by Susan @ Homeschooling Hearts & Minds! 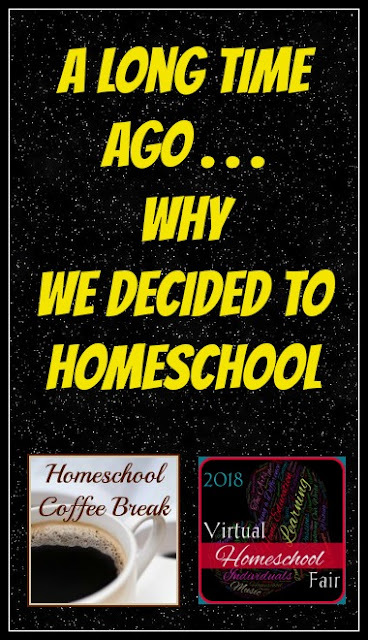 Each week of the Virtual Homeschool Fair has a theme, and we're starting with a theme that takes us back to our homeschool roots - answering the question "Why do we homeschool?" There are so many reasons for choosing home education to begin with, and often we find new reasons to keep homeschooling! Our homeschool story started what seems like a long time ago, and in a place far away . . . Okay, not a galaxy far away, but in a different country at least. Young children belong with their family. Our oldest son was not quite a year old when we moved from western Canada to southern New Jersey. A co-worker of my hubby's was the head of a homeschool family, and that was a valuable connection when it came to making our decision. They steered us in the right direction for finding out how to homeschool legally - and that we could homeschool legally in all fifty states! - and how to get started. We were about 95% sure that this was what we were going to do, and then we realized that if Harrison was going to attend Kindergarten at the public school, he would have to ride a bus - the same bus that kids all the way through eighth grade would be riding. And for all-day Kindergarten. Ummm, that was a big bucket of Nope. That didn't seem safe, and there was something about it that struck me as unnatural too. Unnatural for my five-year-old to have to fend for himself on that bus and be away from home for most of the day. Decision cemented. About that same time, we were preparing for a move to another state, and our second child had joined the family. Moving and upheaval, new church, new surroundings, etc, and we knew my going to work and putting children in daycare was not an option anyway, so it made even more sense to homeschool. We can decide what our kids learn, and when. There were a lot of little things that played a role in this part of our reasoning, but something that came up often during those first years living in the United States was that a surprising number of the people we met had so little knowledge about Canada. Not kidding, reasonably well educated adults made statements like "Canada is that state up north, near Alaska, right?" and it bothered me. I had long ago stopped saying I was from Calgary because it generally earned me blank stares. I just went with Canada. Yeah, it's a huge country, but since people didn't seem to realize that Niagara Falls is actually not near to Calgary at all . . . And we wanted our children to know about the country we came from as well as the United States, and about other parts of the world as well. We wanted our kids to be able to learn at their own pace. We were determined to educate them from a Biblical worldview. We believed it was our God-given right and responsibility as parents to direct the education of our children. We can take the time to educate and disciple, and to enjoy each other's company. There's no question that we are to disciple our children as they grow up, and education and discipleship are closely related. Discipleship requires time spent together if we're to talk about God's commandments at home and as we walk along the road, when we start our day and when we end it. We believe that having our children with us for the majority of their days is better than turning them over to an institution for the biggest part of their day. Speaking of time, we actually wanted to spend time together as a family! I mean, that's how it's supposed to be, right? We should like being together, and when we go on family outings or vacations, we should enjoy each other's company. That was another goal of ours in choosing to homeschool - to be more in control of our time, and for family time to be frequent and important. As homeschoolers, we are in charge of our school year calendar, our weekly schedules, our daily routines, our sick days, our snow days, and our vacations. Selfish? Perhaps, but I sure like not having to get the school's permission to take a family vacation in October if that's what we want to do! We can do what's best for us. When it comes to education, one size does not fit all! We wanted to homeschool because our kids could learn to read at their own pace, and focus on studies that were most important and interesting to them. We could make our school schedule fit our lifestyle. We could choose the best curriculum or learning approach for each kid and for each grade level. And I am not going to lie - I didn't want to have to get up early to put my kids on the school bus, or sit in my pajamas in the carpool pick-up lane. My kids wouldn't have wanted that either! We can sleep a little later, and we can stay in our pajamas during class. It's all good. What are some of your reasons for homeschooling? Leave a comment and let me know! Also, please visit my fellow homeschool bloggers as they share thoughts on "The Reasons We Homeschool" in this week's Virtual Homeschool Fair. This post is part of the Virtual Homeschool Fair 2018. This year the Virtual Homeschool Fair is hosted by Susan at Homeschooling Hearts & Minds. Visit my fellow bloggers listed below and find out about "The Reasons We Homeschool" (all posts will be live by 8am EST on January 8, 2018)! 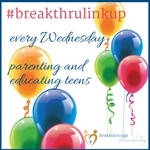 This post is also part of a #breakthrulinkup at Breakthrough Homeschooling - Join us! Visit the Homeschool Review Crew blog for A Round Up of Why We Homeschool, and find out what motivated other Crew members. This will be live on Friday, February 26th. I love being able to meet my kids at their skill level. Being together as a family has absolutely been one of the most important things for me! All those reasons are important to me, too; the longer I homeschool, the more restrictive the dictates of the public school schedule look to me. In addition, my husband and I both spent a lot of time sitting and waiting, and bullying was a big issue for us. 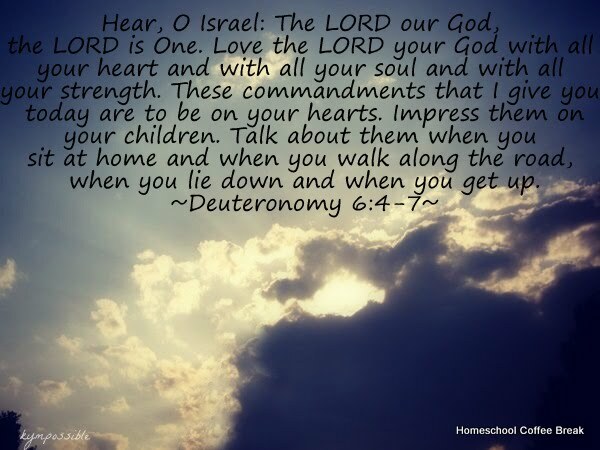 Now, though, the number one reasons why we homeschool all have to do with our faith. It's funny; that was not even on the radar when we started, but it's gradually grown until it's the most important reason, by far.